totally sign me up for this thread! i also found a video on my computer of Richard and Lorelai, its a sad one "if you could read my mind" by bsxamsll that could go in the opening if its okay with bsxamsll.. i don't wanna reupload it without permission though. I mean, it's all any of us wants - to find a nice person to hang out with 'til we drop dead. Not a lot to ask. Mareike's post above made me remember another great moment. It's almost my favorite. There's just something I love about this scene. I like both realtionships,R/L as well as E/L.I love that there seems to be so much to be solved,to heal.And I love the different ways of dealing with it.You barely ever see how much Richard cares about his daughter.He seems so uninterested due to his unability to show emotions.But if he does so,it just gets to you,because it´s played out in a way that´s overwhelming you. With Emily it´s different.The whole realtionship is built up on conflicts,on showing emotions,on speaking your mind rather than holding things back.And in every discussion,in every fight you recognize a glimpse of the love they both share. ^maybe you could pull a shipper name from that scene something related to the kinds of things did they bought? That's what I was thinking. I was trying to think of a name from that whole episode, but all that came was lame stuff. I think that that episode is probably one of the best, because it links them with one of the things they have in common - work. I agree - though Emily and Lorelai barely touch the subject either - they're arguing about little things, and yes their emotions are coming from Lorelai running away, but we still need to see a real talk about it. In some way Emily never told Lorelai what Richard said in 115. I know the Music-Video - it's great. bxmsll has a site though where it is, can't remember the name right now. ohhhhhh right right she does have a site! i'll try and look for it, then maybe just a link would work? I just found the site - but seems that it's offline or so. Hmm. Maybe we should PM her about it? i looked and i actually found this looks like a more permanent site for videos. Those are really good reasons. I tried to think of more, but I'm drawing a blank, I'll think some more later. Luke: But tonight I will give you my extremely positive views on other aspects of your being. Owen:We can do this. All you have to do is say yes. Could I please go on the list ? Now for those of you who don't know I'm Greek and they are broadcasting S5 now, andf today they had S....GT. Lot's of Rich and Lorelai in there. Anyway the scene at the Dragonfly is cute. 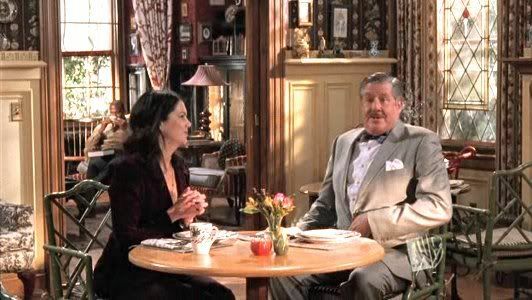 RICHARD: You know, I have to say, Lorelai. You’ve done a wonderful job here. LORELAI [surprised]: Thank you, Dad. RICHARD: Well, the restoration. The rooms. The homey feel. And the stables – very smart. LORELAI: They turned out to be quite a draw. RICHARD: Hmm. You know, small inns like this are very fashionable right now. The larger hotel chains are constantly searching to acquire charming places like this. They keep them just as they are, usually retain the management. I could, uh, do a little sniffing around for you if you like. LORELAI: Are you talking about selling my inn? RICHARD: Well, you would still run it. But you’d make a lot of money. RICHARD: Well, you should really think about it. LORELAI: I don’t think I’m going to be selling this place, but thank you for the suggestion. RICHARD: Yes, well, if you change your mind. LORELAI: Yes, I know where to find you. RICHARD: Oh, my, what is that heavenly smell? RICHARD: I have never smelled anything as heavenly as this. 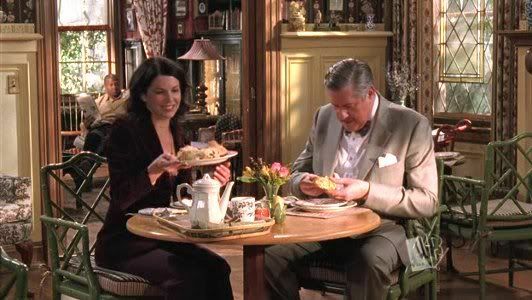 LORELAI: Wait till you taste them. As for the shipper name since they are the two bussiness minds in the family maybe we could have a play on that....I haven't though of anything, but it's just an idea. Might give insiration to someone much more creative. - Karmageddon: It's when everybody is sending off all these really bad vibes, and then the Earth explodes and it's a serious bummer. - Depression is merely anger without enthusiasm. Actually..that's not bad at all. Not bad at all. We have our first shipper name up for consideration!